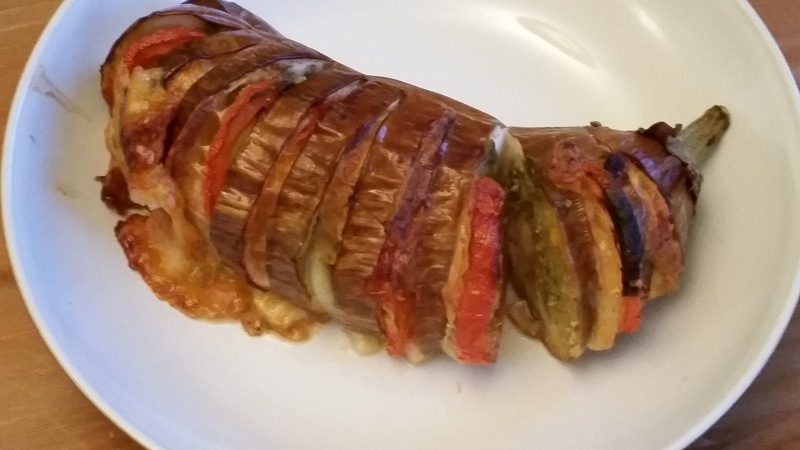 Another fairly recent discovery in my blog reading is Family Friends Food where Helen shares her great Jewish recipes, including this rather tempting recipe for Stuffed Aubergines. Now, the great thing about this one is that with only a few tweaks, it comes out at 7pp a portion. For a large aubergine with lots of delicious cheese and a little bit of a pesto kick, it's amazing. Another excellent thing about it is that it makes two delicious portions for Roo and she devours it with gusto - the aubergine softens and all bar the skin is really easy for her to eat. It's a bit of a cheat on the quick meals series, mainly because it takes about an hour and ten minutes - however, as the majority of that is in the oven, it'll pass. I served it with a few mushrooms sautéed in a dot of butter because I haven't had them in ages.... and they are tasty. I used graffiti aubergines for this, thinking smugly to myself of how beautiful they would look in the pictures. Not a bit of it - the cooking process meant that they looked no different than the normal purple ones. Oh well. Stats: - an aubergine serves one adult or two babies. It is 7pp an aubergine. 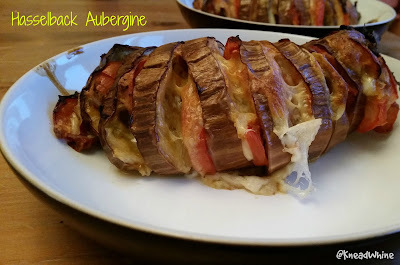 I made the recipe as per the link above - the major difference is that I halved the amount of cheese per aubergine and I limited the amount of pesto. I alternated spreading pesto and tomato puree on the cuts. Give them a try - they generated a lot of interest on Instagram and I can understand why - after all - mozzarella is a win. You can probably drop the points value still further by opting for light mozzarella but I try not to opt for lighter versions - partly because I like to offer Roo what I'm eating but also because I'm not so sure that I want foods with a million different additives in them. Real food all the way. It's working well enough for me at the moment - I'm almost 15lbs down so far.